are among the handful of pioneers of that area. can e-mail me at jnr@cogeco.ca. Prentice sisters. i am tracking the Prentice line. on Maria Moore one of the daughters of Sarah Prentice and Job Moore. had six more. Thank you for reading this. as follows:  Charles b. 1847 m. Mary Ann O'Brien, Benjamin b. 1849, John b.
with my grandfather (another Charles). Thanks for putting this stuff up. adding my Moores which is almost 1,000 individuals. Martin, David, Job, etc from around this area. common belief that they were "late" Loyalists, etc. that it would be David Moore son of David Moore and Deborah Mary Prentice. 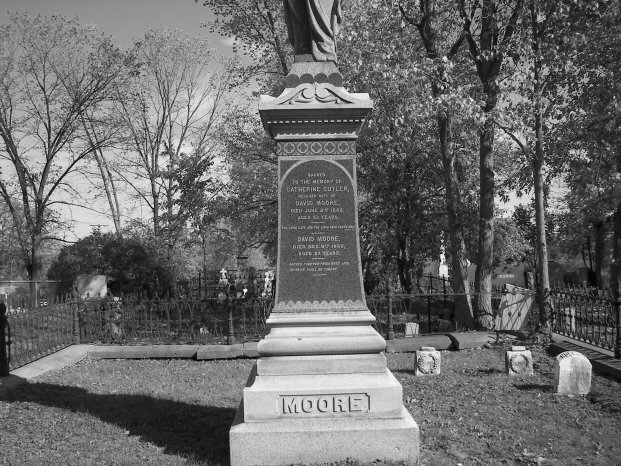 Moore who died in Jan 28 1892.
informative site, by the way, and easy to navigate. to send this e-mail to anyone whom you think may be interested. Pelletier, Cecilia Pelletier. (  see link to photographs of Cecilia Pelletier below, dated May 15, 2015). to wonder if perhaps she was of native ancestry. Any ideas? Added e-mail address for Dennis Moore to the list below. You should include the Dudley Moore families on your list of founding families. Dudley and his families went from Bennington county, Vermont to The Ottawa Area. and is in the book about the U.E.L's. the census for that area in 1796. Then he went to Eardley, Que. Ingles, Waller, and Moulton families. Dudley Jr. and Jedediah Jr married in in Vermont, USA before coming to Canada. They came later in 1800..
descendent of Jedidiah, Dudley, Sr, Roger, Calvin David, Archibald. Jedidiah Moore died in Duchess, New York and not Eardley Township where he lived. the rest of his family before he died. Anybody got any information about this? home of my ancestor Roger Moore. I don’t have any further information on this. There were too many of the Moore family to trace that were not direct ancestors. end up in your website. if she found any. I would also be interested in getting any more of the Moore family history that is out there and photos if possible. I may have other information buried but off the top here's what I have. have discovered more, or different information. (Dupont) - St-François-de-Sale, Pointe-Gatineau, QC on 1848 Jul 26. I have her as one of 8 children. Marie-Louise Cécile married in Nicolet, QC 1814 Sep 26. Lefebvre married Baie-du-Febvre, QC 1744 May 3. Meneux-dit-Chateauneuf married  Ste-Famille, Ile d'Orléans, QC 1697 Jul 9. Moriceau or (Morrisseau) married Notre-Dame, Québec City, QC 1661 Sep 26. Tadoussac, QC a year earlier so maybe this is where the "native"
(abt 1611-1689) - St-Pierre, Gallardon, Beauce, France married about 1632.
months later on 1867 Jan 31st! was my grandfather who died in 1966. Cemetery in the Aylmer sector of Gatineau. My mother remembers her. married to Melissa Phillips, children include Uri Seth Phillips, born 1857, died 1896, also Robert, Carrie, Hattie, George and William. I don't know Melissa Phillips' maiden name and I can't get any further back than Robert. It seems to be such a common name. If anyone has any information on that branch that would be appreciated as well.